Because of high traffic flow, do consider 90º Tip Flatback Slatwall Hook For Endcap as an outfitting upgrade. The 90º Tip acts as Display Hook productstop and keeps merchandise on the hook, and not easily dislodged. A broad Flatback Backplate provides generous support and minimizes damage to the Slatwall surface. 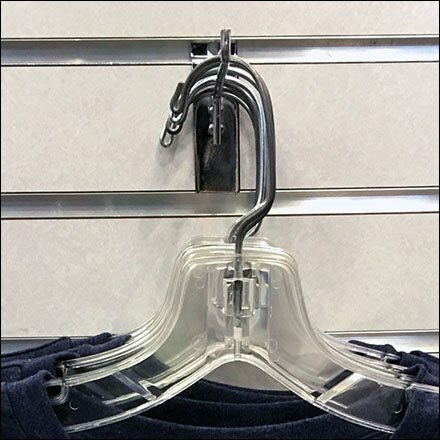 This 90º Tip Flatback Slatwall Hook For Endcap seen at Motherhood Maternity, The Shoppes at Montage Ski Resort, PA.